indEx can now also offer a complementary range of Ex d flameproof IIB enclosures to go with our explosion proof Ex e and ia enclosures, cabinets control stations and terminal boxes. Generally manufactured from copper free, sand or die cast aluminium, Ex d can be used for zone 1 and 2 areas where Stainless steel Ex e cabinets, panels and terminal enclosures are considered unsuitable. Based on the MEG (maximum experimental gap) experiments of the early to middle part of last century they were originally developed to protect electrical and safety critical systems in mining (group I) industries. However, these days they are now only intended for use in surface (group II, gas & group III dust) industries and can be used for many different applications. The construction has not changed much in all that time and they are still cast as heavy constructions, with bolted or screw type lids depending on the intended gas group. Some welded constructions are also available in aluminium and stainless steel but these tend to be expensive with very long lead times. 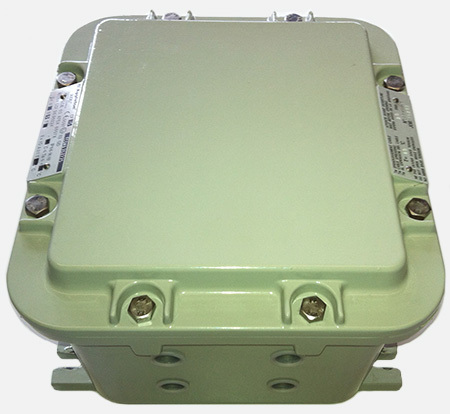 By definition an Ex d enclosure Prevents transmission of an internal ignition to its surroundings by containing the explosion within the enclosure. It does this by allowing the explosion to escape through a very narrow gap called a FLAM PATH. The action of Forcing a gaseous or dust exploding cloud through a tiny aperture cools the ignited material to such a degree that it cannot ignite the surrounding area outside ( AIT- Auto ignition temperature) and thus a major explosion is averted. In this instance our customer required a proportional valve for use in a zone 2 application together with several Ex e stainless steel Ex e terminal boxes.